Several things must be said about the Dramatica creative writing software program, published by Screenplay Systems. First, you should know before you buy it that this software is based upon a very detailed and complex theory of how stories work. The articles in the How To Write a Novel section are just a brief glimpse into the totality of Dramatica theory. The theory describes how, in a well structured story, plot elements, characters, and several types of thematic elements will exist in a balanced relationship with each other – a relationship that can be expressed in mathematical terms. The current version of the software recognizes over 32,000 possible arrangements of story elements that are dramatically sound (though in theory, four times this number may be possible). 32,000 story forms are more than you will ever need. Few novelists write more than 100 books in their lifetime. Besides, you could use the same story form for dozens of novels without appearing too formulaic. Harry Potter and Star Wars use similar structures yet they are quite different stories. Readers who are paying attention may notice the similarities, but most won't. 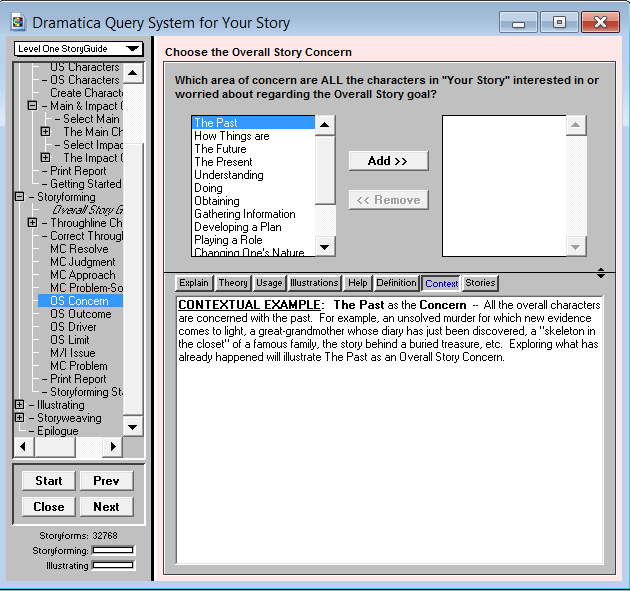 Dramatica software works by inviting you to make choices about elements in your story – either a story you are developing or one you've written but want to improve. Each decision you make narrows the list of story forms until finally there is only one structure that fits with all your choices. At that point, the software gives you information about what other story elements you should add, or how to adjust the other elements in order to make your story complete, well structured, and emotionally compelling. Hence, the software is correctly marketed as the only product that can tell you things about your story that you didn't know. This is a light version with fewer features, but may be a good choice if you don't want to get too involved in the theory. This is the full-featured version for Windows. It uses the same patented mathematical model of story structure, but with expanded features. In particular it provides a more in-depth way to structure characters. The Mac version has added features designed to make story creation easier by replacing jargon with terms of the writer's choosing. The second thing you should know about this software is that it is controversial. There are those who are offended by the very idea that mathematics can be applied to an artistic endeavour such as story writing. Into this category falls no less a figure than Robert Mckee, the screenwriting guru and author of the book, Story: Substance, Structure, Style, and the Principles of Screenwriting. On the other hand, fiction isn't the first art form to have mathematics used to describe its structure. For instance, the mathematical ratio known as the Golden Section has been used in architecture and painting for thousands of years to create aesthetically pleasing works. Moreover, a growing number of highly successful authors and screenwriters praise the usefulness of both the theory and the software. Another difficulty with the software is that, in order to use it effectively, you need to understand the theory. While the software includes plenty of help at every stage, and comes with a digital version of the theory book, the learning curve is quite steep. Dramatica is a very different way of looking at stories than most people are used to and it takes time to grasp it fully. Writers have been known to spend many months learning the theory (and not getting a lot of stories written in the meantime). You may want a little instruction to shorten the learning curve (we try to offer some instruction on this site). One other drawback is that the software was created a few years ago. While the Mac version has been more recently updated, the Windows version lacks some of the navigation functions you expect to find in most software and doesn't yet include all the features of its Mac counterpart. All that aside, there are many positive things about Dramatica that make it a worthwhile investment. Despite any shortcomings, Dramatica is undeniably a work of genius. Melanie Anne Phillips and Chris Huntley, who invented both the theory and the software, have made a totally original and monumental contribution to our understanding of how to write good stories. I fully believe Ph.D. students will one day be writing dissertations theses based on their work. If you're a fiction writer, the software can help ensure your story has a sound plot, good character development and a solid thematic core. It can take you from a basic idea to a fully formed outline in a matter of hours! Once you have made at least one important choice, you can turn to the Theme Browser or Plot Progression windows to look at the story as a whole and make further choices from that perspective. You are free to jump from one path to another according to your creative instinct. The program lets you print out a large variety of reports which look at the choices you have made and the relationships between the various story elements, helping you to understand your story in a very deep way before you start writing (if you're a plotter) or if you're hoping to improve an existing manuscript. 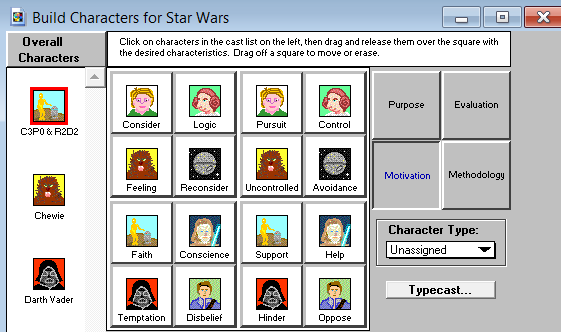 One final thing I should mention... the creators of Dramatica were primarily interested in screenwriting, so the software assumes that's your interest too. Most of the story examples are taken from films. However, the software can easily be used for any kind of fiction writing you want to do. If you'd like to own a copy of Dramatica software, you can find all three versions on Amazon.